Woke up this morning feeling really liberal and respectful. I think I’ll make a big banner that tells everyone how respectful I am, and demand that they respect it. Been singing that Aretha Franklin song all day. R.E.S.P.E.C.T, that’s all I want from you, you see. R.E.S.P.E.C.T, just don’t expect it back from me…. Slagged off Brexit in a respectful way for a while though not sure why cos I love it!! Hopefully that Arlene one will keep talking and there’ll be a United Ireland before I’m 49 & 3/4. Wrote something liberal and respectful to reach out to deluded Unionists before catching a plane to America. Flew working class. Did a bit of respectful fundraising for ‘local charities’ with our American friends. They show so much understanding of our complex and nuanced political situation back home. Shouted “up the Ra” a few times. Everyone back home is kicking off cos I got my photo tuck with that banner, but I was being respectful. 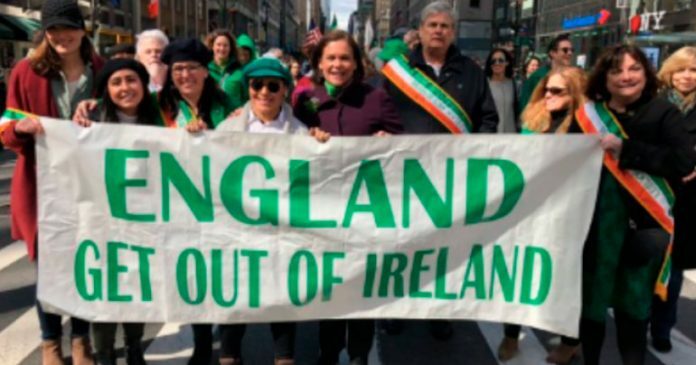 It says ”’England out of Ireland” not “English”. If it was English then Gerry might have to leave, what with his surname. Raised some more money for local charities, kinda half opposed Brexit, promoted equality. Someone just told me St Patrick was from Britain, and we kidnapped him. That can’t be true, if it was he’d have been given a fair trial then buried in a bog, respectfully.